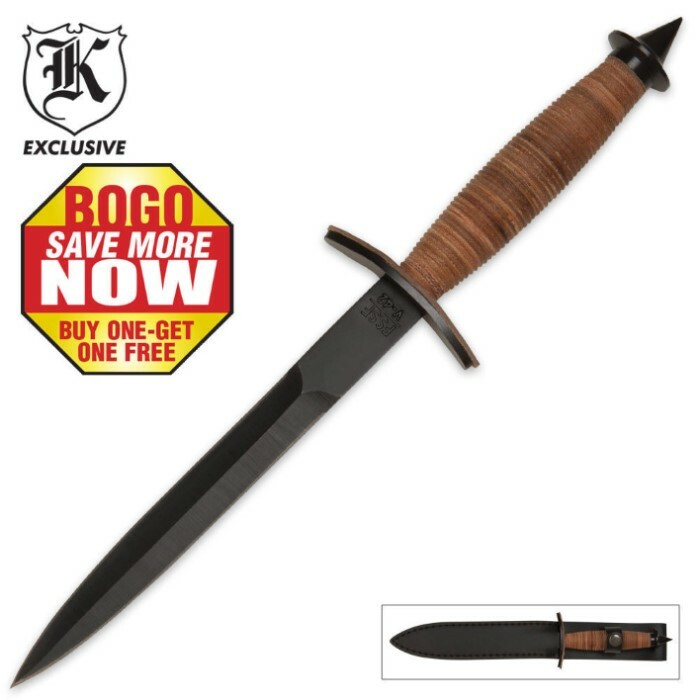 V42 Military Stiletto Dagger with Sheath 2 For 1 | BUDK.com - Knives & Swords At The Lowest Prices! These are really nice looking, need a little "Tweeking" loose handles on them fixed with some leather cord added to the handle and screwed the end cap back on better. but fun for the price, there are always letters to open, Let me at that mail! Got 2 for the BOGO sale. The original V-42 is good. This copy has problems. The blade significantly narrows to 1/4inch going into the handle. The stacked leather is already loose on one of them. Not a combat ready knife as this would snap in half at the guard if any significant pressure was put on it at either side.....but makes an awesome letter opener. I purchased this knife, as a replacement for a 'made in pah-kee-stan' copy of a Fairbairn Sykes knife, that had the blade mounted off it's longitudinal axis, and with a 15 degree yaw. (Great QC job, eh?) I needed an American-designed knife for a set purpose, and I did not wish to employ my USAF-acquired pilot's knife, for it can be an intimidating piece of metal, to an untrained eye. Therefore, I ordered the Model V-42. I have handled the similar Aaron Banks Commemorative model, and found the blade to fit my hand well, and to 'be quick in the wrist', as some might say, but the scabbard, though to the original design, was a tad too long, for table placement. Another plus, for this particular model. Well I first came across this knife because I had been watching a military program on the real version if this knife. When I found this replica I figured why not, 2 for 1. When I got the knives they were disappointing. They were not even clise to razor sharp, and you can tell they were cheaply sharpened. One of the knives I recieved was fine, the only problem was a loose hilt, I only had to unscrew the end to tighten it. Before I forget I was disappointed with the stacked leather handle. AS for the other one is was going to return it, The only reason I didn't was because I chose to think I got this one for free. The tip of the blade was bent, not even close to razor sharp, had to tighten the handle, and the hand guard left a gap between the blade and the handle which can be fixed. Over all I guess I was happy though I got what I wanted, BUT not nearly what I was a hoping to get. SIR! MY REPORT ON THE ABOVE-NAMED WEAPON AND ACTION TAKEN IS AS FOLLOWS: THE ARMORER, CORP. HAWKS AND I FOUND THE DAGGER TO BE AN EXACT DUPLICATE OF THE ONE ISSUED TO COL. FREDERICKS' FIRST SPECIAL SERVICE FORCE IN 1942. THIS RANGER UNIT WAS DUBBED "THE DEVIL'S BRIGADE" BY IT'S WEHRMACHT OPPONENT IN ITALY. THE ARMY, IN IT'S WISDOM, DECORATED THEM AND THEN DISBANDED THE UNIT. WE FIND THIS ONE TO BE AS GOOD AS THE 1942 KNIFE. THE PRICE ON THIS FINE WEAPON WAS LESS THAN 4 DOLLARS EACH ON BOGO AND AFTER DISCOUNTS. WE PURCHASED 40 OF THESE AND WILL ISSUE ONE TO EACH MEMBER OF OUR AMERICAN LEGION UNIT. I DON'T EXPECT OUR AGING MEMBERSHIP TO USE THEM IN COMBAT MUCH. BUT AIN'T IT NICE!! THAT,SIR, IS MY REPORT. DAN BELEW, SGT. COMMANDING THE FIRING SQUAD. I ordered this knife because I liked the look and the option of a long bladed dagger. It is what I expected. I really like the stacked leather handle as it will not slip if the handle gets wet. Leather sheath is of better quality than I expected. I guess my only disappointment would be that I have a different definition of Razor Sharp.